America’s Ebony Magazine bills him as the “ a throwback to the best of Seventies soul” and he is bringing his Southern vibe and smoothness to Australia for the first time on 27th November for an intimate performance at Sydney’s Blue Beat in Double Bay. 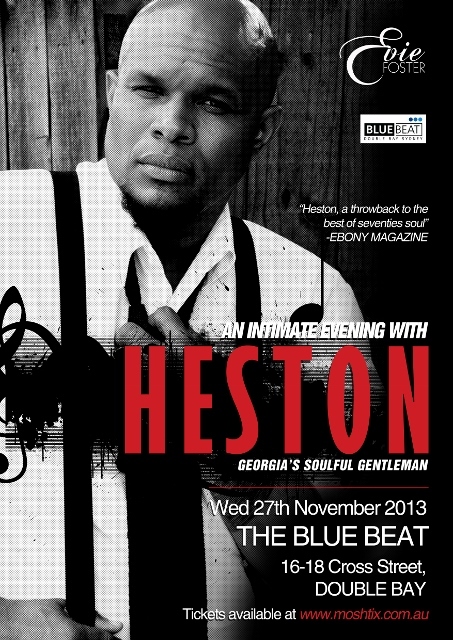 Georgia’s Soulful Gentleman, Heston, is preparing to wow our audience with a selection of tracks from his current album ‘Love Junkie’ and whilst this is his first visit Down Under, Heston is a seasoned veteran this this music game. Three albums in and a legion of fans in the US and internationally, this visit to our shores is all about timing for the soulful sage and serves as a prelude to a full tour of Australia in February of 2014. Coming to Australia to promote his fourth album ‘ Love Junkie’ see’s the soulful Heston bring his highly acclaimed vocals and sound to our shores after touring the world for the last few years, travelling from the US to Japan and Europe, wooing the crowds with a sound that is reminiscent of early Mavin Gaye. An honest and raw artist, Heston is renowned for confident lyrics laced with ‘grown man’ sensuality and is nostalgic in an old skool classic kind of way. 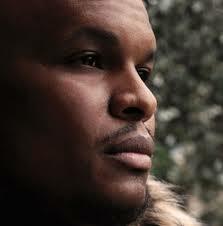 Hailing from the Dominican Republic and residing in Atlanta Georgia for most of career, Heston is not to write and perform music that is fraught with meaning, highlighting the inner workings of the heart of a hot blooded man who is unabashedly romantic. Taking his audience on an intimate journey to his inner most thoughts, Heston’s performance is sure to appeal to the real music lover and gain him a whole new level of fandom here in Australia. The award winning singer/ songwriter has been in the music game for over 10 years, mastering the art of smooth with his three previous albums, Storyteller, Warm Human Cold World and Special Edition. 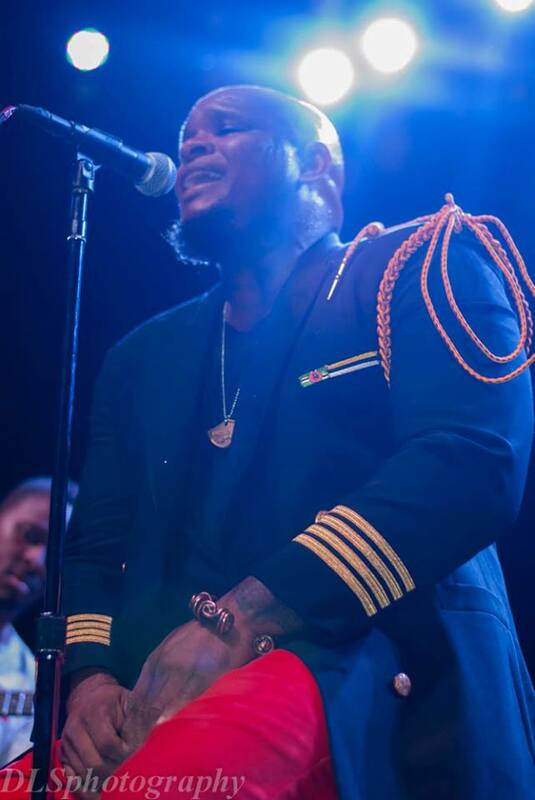 Recently taking out the award for most Outstanding Album for 2013 ( Warm Human Cold Heart )at the EOTM Awards this year, Heston is the go to artist for a sound that is transcendent and true in today independent soul music genre. Signed to Sweet Soul Records in Japan and Dome Records in the UK, Heston is securing his place with this current Love Junkies album as ‘ he quotes is his “best album yet”. Confidence is the tool of the trade in the music game, especially when you are an artist that walks his own path and makes music on his terms, and in this artist case, it is safe to say that confidence and Heston go hand in hand! You are heading down to Australia for the first time in about 2 weeks for some live and intimate shows bringing your definitive smooth sound to share with our audiences ……how are you feeling about your impending trip and visiting Australia? I can’t wait. I am excited and looking forward to all of it, the Country, the City, the Blue Beat and the people. 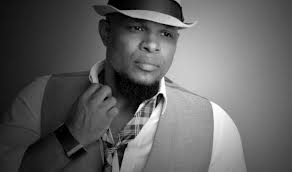 You have been compared to the likes of Marvin Gaye and Leon Ware with your vocal ability and musicality …… how would you best describe Heston and your sound? The ‘Heston’ sound I would describe as a combination of all the greats that I have been influenced by – The Bee Gees, Marvin Gaye, Nat King Cole, Bob Marley, Diana Ross, Barbara Streisand and the list goes on. To be compared to the likes of Marvin Gaye is an honour in itself and I am humbled by the comparison. You represent Atlanta, Georgia and hail from The Dominican Republic ….. can you share with us what your musical journey has been like to date and what the major influences have been in your life that have led you to music? Good question. My musical journey to date has been a slow and steady progress in which I continue to learn and grow. All of the major influences have been the ones that I mentioned previously and I even find today, in new music, influence my sound but always stems from soul music, especially from the 60’s and 70’s. My focus is to build as an artist, as a singer and as a songwriter. Your current single “Love Junkie” is off your third album of the same title and has garnered you a whole new legion of fans as far as Japan and now Australia. What do you think has been different for you in the creative process with this album compared to your previous two albums? The difference between this album and my previous works is the attention to the production value. I took a step back from producing and focused on song writing and arranging. I brought producers to the project that could bring out the best in me and pay attention to the “head nod” test which is to make sure the music moves you!!! What is in your current playlist right now? Favourite artists/ music genres Heston likes to listen to and why? Reggae is always #1 for me Beres Hammond and Bob Marley will always be on my playlist. Anthony Hamilton is someone I enjoy listening to and also Alicia Keys – love her writing, her voice and her passion. Sadly, I have found I have not been listening to too much music of late as I have been working on my own and busy promoting the Album. Where do you see yourself and your career in about 5 years from now? In about 5 years I would love to have at least 3 more albums and a significant touring schedule which would allow me to pick and choose the places I would love to see and experience around the World. In 5 years I will have experienced growth and have produced better album after better album. I will be grateful to my growing fan base but through it all I will stay true to the music that I love. What is your greatest motivation in life? That is easy. My son and daughter, Haze and Nate` – the love I have for my family and my undying passion for this thing called music.